Carolina Nitsch is pleased to present “Ways of Seeing,” with work by gallery artists EV Day, Richard Dupont and Alyson Shotz, whose techniques and concepts overlap in ways that reveal aspects of our technologically laden time. 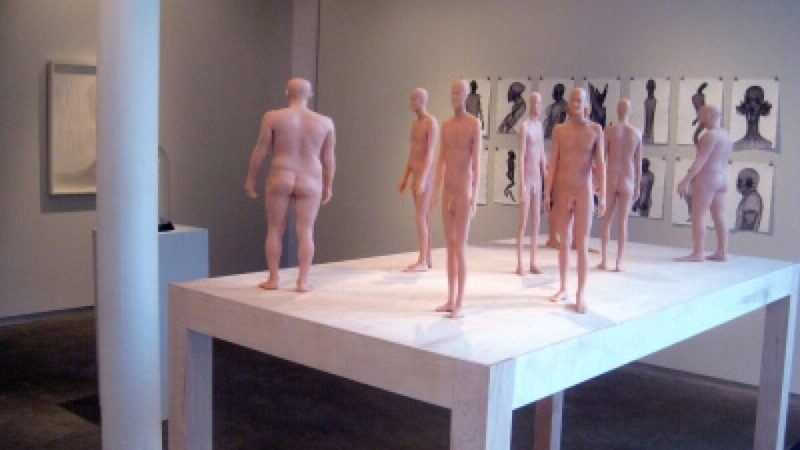 Upon entering the gallery the viewer is immediately confronted by Them, 2005, Richard Dupont’s sculpture comprised of 8 distorted figures atop a wooden platform. Each is pulled, stretched or squashed on a different axis. 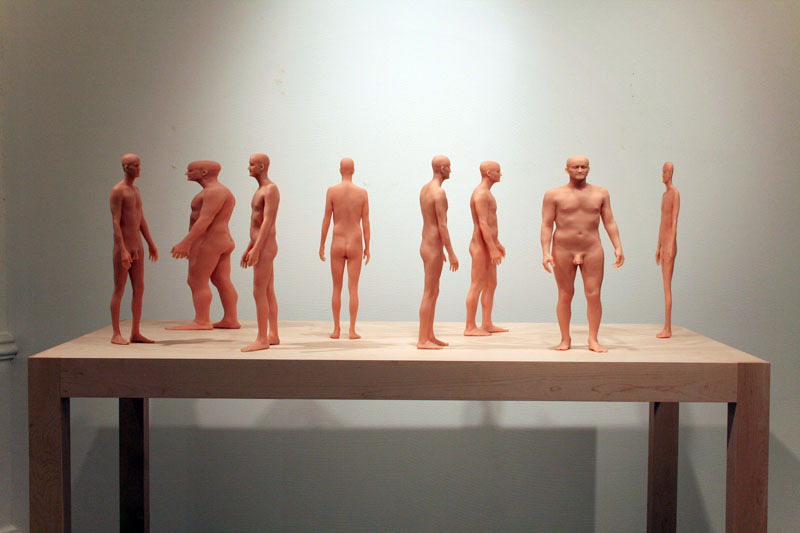 These cloned shape shifters stand like totems in cyberspace; perhaps cautionary markers along our “information superhighway” reminding us that we are not only comprised of our physical self, but also our “digital” self. On the West wall are 14 computer-manipulated drawings that take these distorted figures into even more extreme realms. Here we get a glimpse into the technical process, which Dupont uses to create these bizarre forms. The 14 Variations reference Giacometti, Picasso and the futurists as well as biotechnology and cross gender issues. We also find a somewhat related tangled web of vectors in E.V. Day’s recent Bridal Glove, 2010. EV’s sculpture captures this garment as a specimen in a bell jar causing us to wonder if this is some Victorian relic or a time capsule for future generations to ponder. Day’s work often involves women’s clothing and undergarments manipulated in ways to create unexpected associations with technology, science and the political gender status quo. For Hugh Hefner’s Private Jet, 1999 she steals the format of the blueprint away from the male dominated architecture profession and offers a humorous metaphor of the male psyche as internal and external organs in an orgasmic explosion. Alyson Shotz, long interested in how we experience science and technology, also has created a series of works that employ lines and vectors, which she has titled 4-dimensional string drawings. These pieces allude to theories in physics regarding alternate dimensions of reality and string theory. Her work on the South wall, comprised of pencil, pins, and string, creates a delicate abstract form that seems to be unfolding and shifting as we get closer or view it from different angles. In Arnolfini 360 x 5, a sequence of domed surveillance mirrors, Shotz uses optical devices to disorient the viewer and question one’s sense of location and space. The title alludes to the famous 15th century Flemish painting The Arnolfini Wedding by Jan Van Eyck, in which a mystical convex mirror can be seen in the background, just like the multi-lens eye in Arnolfini 360 x 5 refers to our increasingly watched-over, recorded, and surveyed civic life. These three artists utilize different mediums and techniques to address similar overlapping themes of Futurism, dystopia, biotechnology, humor, cynicism, and surveillance. As we exit the first decade of our Internet burdened 21st century these are themes which increasingly confront us - here are three artists who offer us unique objects and drawings which we might use to “divine” our way into the future.